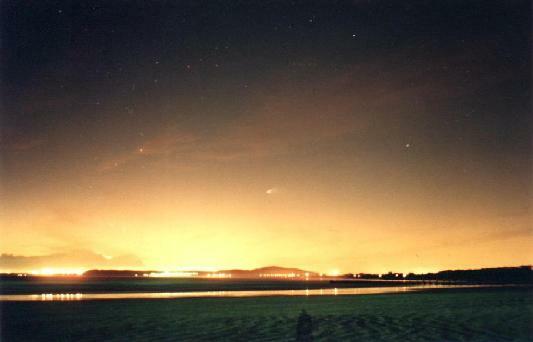 Explanation: Fighting the glow of the setting sun and the city lights of Cape Town, South Africa, comet Hale-Bopp is just visible near the center of this panoramic view - photographed on May 3rd. In the foreground is the Strand beach front, about 50 km East of Cape Town, while the Cape Peninsula mountain ranges can be seen at the left along the horizon. The bright star visible above and to the left of the comet is the red giant Aldebaran in the constellation Taurus. As Hale-Bopp continues its outbound journey during the month of May it will climb higher into evening southern skies. Still a bright comet it is now providing an enjoyable and much anticipated showing for Southern Hemisphere observers. Tomorrow's picture: Signed, "A Black Hole"